In January, the U.S. Agency for International Development released its long-awaited climate change strategy. Climate Change & Development: Clean Resilient Growth provides a blueprint for addressing climate change through development assistance programs and operations. In addition to objectives around mitigation and adaptation, the strategy also outlines a third objective: improving overall operational integration. The five-year strategy has a clear, succinct goal: “to enable countries to accelerate their transition to climate-resilient low emission sustainable economic development.” Developed by a USAID task force with input from multiple U.S. agencies and NGOs, the document paints a picture of the threats climate change poses for development – calling it “among the greatest global challenges of our generation” – and commits the agency to addressing both the causes of climate change and the impacts it will have on communities in countries around the world. These statements are noteworthy in a fiscal climate that has put development assistance under renewed scrutiny and in a political environment where progress on climate change legislation seems unlikely. To make the case for prioritizing action on climate change, the strategy cites climate change’s likely impact on agricultural productivity and fisheries, which will threaten USAID’s food security goals. It also illustrates the ways in which climate change could exacerbate humanitarian crises and notes work done by the U.S. military and intelligence community in identifying climate change as a “threat multiplier” (or “accelerant of instability” as the Quadrennial Defense Review puts it) with implications for national security. In addition to providing a rationale for action, the strategy provides new insights on how USAID will prioritize its efforts on climate change mitigation and adaptation. It provides a clear directive for the integration of climate change into the agency’s broader development work in areas such as food security, good governance, and global health– a strong and encouraging signal for those interested in cross-sectoral planning and programs. President Obama’s Global Climate Change Initiative, revealed in 2010, focuses efforts around three pillars: clean energy, sustainable landscapes, and adaptation. USAID’s climate strategy fleshes out these three areas, identifying “intermediate results” and indicators of success – such as the development of Low Emission Development Strategies in 20 partner countries, greenhouse gas sequestration through improved ecosystem management, and increasing the number of institutions capable of adaptation planning and response. In laying out ambitious objectives, however, the authors of the strategy acknowledge constrained fiscal realities. The strategy stops short of identifying an ideal budget to support the activities it describes, though it does refer to the U.S. pledge to join other developed countries in providing $30 billion in “fast start financing” in the period of 2010 to 2012 and, for those USAID country missions that will be receiving adaptation and mitigation funding, establishes “floors” of $3 million and $5 million, respectively. The final section of the strategy lists over thirty countries and regions that have already been prioritized for programs, including Bangladesh, India, Kenya, Malawi, and Peru. But “we are unable to work in every country at risk from climate change impacts or with the potential for low carbon sustainable growth,” the strategy asserts. An annex includes selection criteria to guide further funding decisions, including emission reduction potential, high exposure to physical climate change impacts, a suitable enabling environment, coordination with other donors, and diplomatic and geographic considerations. The concept of integration figures prominently throughout the 27-page document. For those of us working in the large and growing space where the global challenges of climate change, food security, health, livelihoods, and governance overlap, this attention is heartening. While it may sometimes seem simply fashionable to pay lip service to the idea of “breaking out of stovepipes,” the strategy identifies concrete ways to incentivize integration. To this end, USAID plans to launch a group of pilot activities. USAID missions must submit pilot program proposals, and selected programs will emphasize integration of top priorities within the agency’s development portfolio (including Feed the Future and the Global Health Initiative). Among other criteria, pilots must demonstrate buy-in from multiple levels of leadership, and will be selected based on their potential to generate integration lessons and tools over the next several years. This kind of integration – the blending of key priorities from multiple sectors, the value of documented lessons and tools, the important role of champions in fostering an enabling environment – mirrors work carried out by USAID’s own population, health, and environment (PHE) portfolio. To date, USAID’s PHE programs have not been designed to address climate challenges specifically, and perhaps not surprisingly they aren’t named specifically in the strategy. But those preparing and evaluating integration pilot proposals may gain useful insights on cross-sectoral integration from a closer look at the accumulated knowledge of more than 10 years of PHE experience. Though not a focus of the strategy, population growth is acknowledged as a stressor – alongside unplanned urbanization, environmental degradation, resource depletion, and poverty – that exacerbates growing challenges in disaster risk reduction and efforts to secure a safe and sufficient water supply. Research has shown that different global population growth scenarios will have significant implications for emissions growth. New analysis indicates that the fastest growing populations are among the most vulnerable to climate change and that in these areas, there is frequently high unmet need for family planning. And we have also clearly seen that in many parts of the world, women’s health and well-being are increasingly intertwined with the effects of changing climate and access to reproductive health services. In its limited mention of population as a challenge, however, the strategy misses the chance to identify it also as an opportunity. Addressing the linked challenges of population growth and climate change offers an opportunity to recommit the resources required to assist of the hundreds of millions of women around the world with ongoing unmet need for family planning. The strategy’s emphasis on integration would seem to be an open door to such opportunities. Integrated, cross-sectoral collaboration that truly fosters a transition to climate-resilient, low-emission sustainable economic development will acknowledge both the challenge presented by rapid population growth and the opportunities that can emerge from expanding family planning access to women worldwide. But for this to happen, cross-sectoral communication will need to become more commonplace. Demographers and reproductive health specialists will need to engage in dialogues on climate change, and climate specialists will need both opportunities and incentives to listen. USAID’s new climate change integration pilots could provide a new platform for this rare but powerful cross-sectoral action. Sources: FastStartFinance.org, International Energy Agency, Maplecroft, Population Action International, The White House, U.S. Department of Defense, USAID. 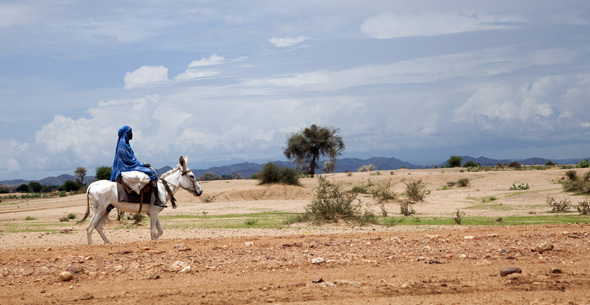 Photo Credit: “Displaced Darfuris Farm in Rainy Season,” courtesy of United Nations Photo. By Francesco Femia & Caitlin Werrell in aid, climate change, United States on March 1, 2012 .